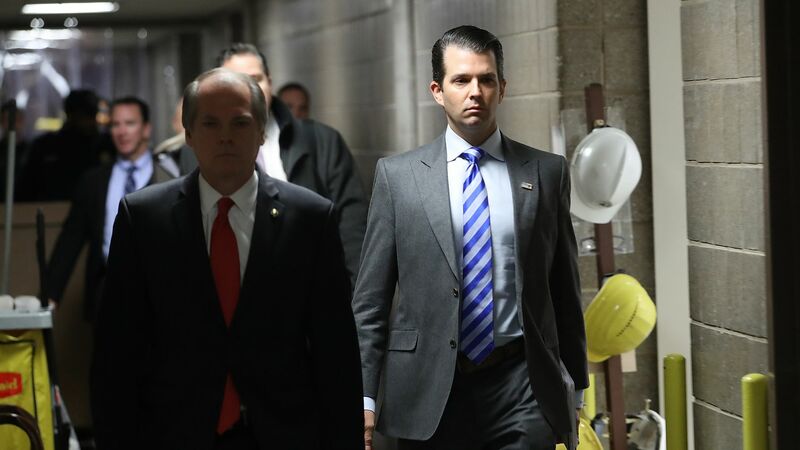 The Senate Judiciary Committee released 1,800 pages of interview transcripts from Donald Trump Jr.'s testimony about a controversial meeting at Trump Tower in June 2016 with a Russian lawyer who has since admitted to working with the Kremlin. Why it matters: The meeting has become a focal point of Robert Mueller's investigation. Trump Jr. said he didn't know if his father was involved in drafting the statement about the meeting: "I never spoke to my father about it." He said the president "may have commented through Hope Hicks." He said Hicks asked him if he wanted to talk to the president about the statement, but "I chose not to because I didn't want to bring him into something that he had nothing to do with." He said his email to Rob Goldstone — "I love it" — was "simply a colloquial way of saying that I appreciated Rob's gesture." Trump Jr. said he was "skeptical" of the meeting all along, and "my skepticism was justified" because "the meeting provided no meaningful information."